BEFORE: I decided to join this challenge because I knew I needed a change. As a mom…with 5 young people to keep up with…I am ready to really work on getting fit. Lately, I’ve been noticing that I have not been consistent and disciplined with working out regularly. My eating habits were not the healthiest of choices. Sugar and carbs are my weakness. So, I am going to follow the Keto eating plan. 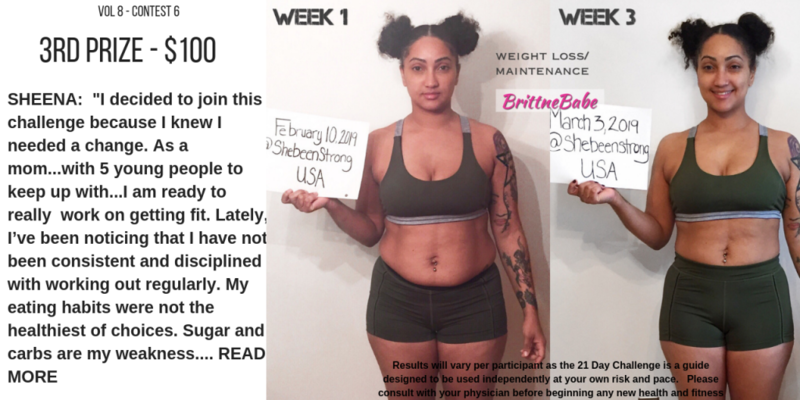 I chose this challenge because I believe that it will help to hold me accountable with improving my health, energy level, body confidence and overall fitness. 21 Days AFTER: I am sooo amazed with my results! I lost almost 5 lbs…doesn’t seem like much, but I can definitely see and feel the difference. My clothes are fitting so much better and I have much more energy during the day now. I still have a ways to go to reach my goals so I am going to keep on pushing myself. I am definitely going to begin another 21day cycle tomorrow ☺️ Thank you sooo much BrittneBabe!